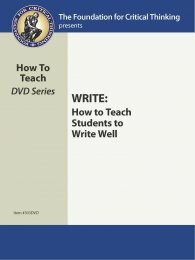 303DVD How to Teach Students to Write Well (Write DVD) $14.95	 Qty. Students cannot develop higher order thinking without developing reasoning abilities, which they cannot develop without frequently engaging in well-disciplined, analytic writing. Present instruction at all levels, however, systematically fails to teach well-disciplined, analytic writing abilities. In this tape, Richard Paul explains and models how to teach for excellence in analytic writing. He details specific strategies and documents some basic mistakes in writing instruction.